Leap into Something New - Spinfy - quality content for kids with smart parents! Spinfy lives this kind moment right now. We know things are going to change and some of them already have. One thing we know for sure, is that we all are excited. And what’s best, we are excited in a good way. We have been creating something new for quite a while now. Countless hours of programming, illustrating and testing have finally reached the final countdown. Something new is coming and it is coming soon. One of the most played casual games in the world combined with unique graphics is what we have achieved after several months of hard work. Our code wizard Joni has been working day and night, not to mention how many hours our CEO Kimmo has spent with testing. 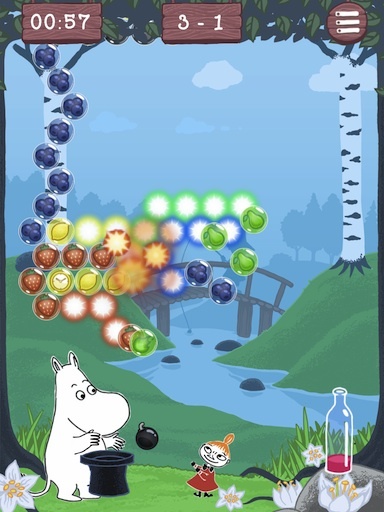 The name of the game is Moomin Bubble. With this bubble shooter game and its adorable graphics we promise you countless moments of enjoyment. Now I have given away the name of the app. Just wait for a little longer and you’ll get it from App Store before you know it. Stay tuned!